This week’s Project 52 theme was “Silhouette.” We’ve had an usually warm week here in New England (it was 70 degrees in February!) so Flint and I have been spending as much time outside as possible. 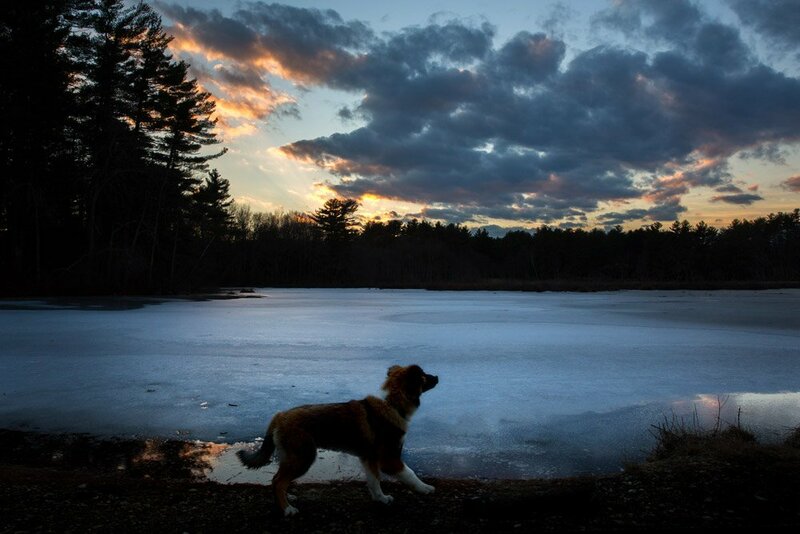 Wednesday evening, we went over to the cranberry bogs for our silhouette photos. Things didn’t work out quite the way I expected because the pond was still frozen. It was still a beautiful evening for a walk anyway, and I’ll never complain about time spent outside with my dog! Ready to see more silhouettes? Next up is Little White Dog Pet Photography in Sioux Falls, SD. Keep following the links in each blog to see all of this week’s photos! Looks very cold! great sky though!! I’m so jealous you had such nice temps! I knew that if anyone would come up with a great looking location for their silhouette, it would be you, Blue. Oh Cranberry Bogs. It’s probably old news to you but would be pretty cool to see. Beautiful location and beautiful model. What a great looking spot! Frozen lake! Eek! Hard to imagine when we’ve been dealing with high temps here. Looks like a lovely spot, and a beautiful sky too. You’ve got a wonderful location shot for your dog! 70 up there….almost 90 here in Tampa, FL ….this is crazy!